Quinta do Lago has received global recognition following its recent transformation into one of the world’s leading modern contemporary golf resorts after being named ‘Europe’s Best Golf Venue’ at the 2015 World Golf Awards. Quinta do Lago has invested more than €50 million upgrading its sports, leisure and lifestyle facilities as part of a six-year investment program, including the €9.6 million redesign of its North Course by renowned American architect Beau Welling in close association with European Ryder Cup winning Captain Paul McGinley. The new accolade continues the resort’s recent success story after it won two awards at the inaugural World Golf Awards last year and was also named ‘Best Golf Resort in Portugal’ at the 2015 Today’s Golfer Travel Awards for the first time in its illustrious history. John Dwyer, chief executive at Quinta do Lago, said: “We’re very proud to have been named the best venue in Europe at such a leading event for the golf industry. This award is deserved recognition for the decision the resort took five years ago to undertake a signicant upgrade and modernisation of all its facilities. 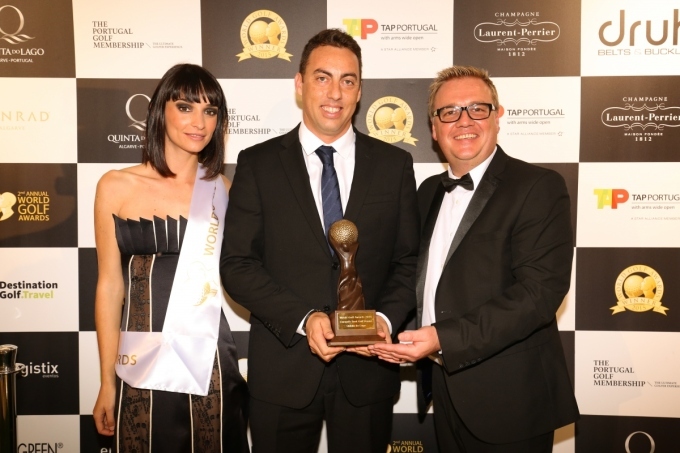 A collection of golf‘s most famous names including legendary commentator Peter Alliss joined leading industry figures at the top family resort for the 2015 World Golf Awards at the Conrad Algarve, which also gave Quinta do Lago the chance to showcase the venue’s world-class facilities including its North Course – voted ‘Europe’s Best New Course’ at the 2014 awards ceremony. In addition to offering a weekend of unrivalled networking opportunities, the event also gave guests the chance to enjoy Quinta do Lago’s numerous five-star facilities including its three award-winning championship golf courses, as well as experiencing its new Bovino Steakhouse, one of ten exclusive bars and restaurants that visitors can enjoy at the resort. And further investment is planned in 2016 with the creation of a new state-of-the-art sports centre, with the new facility offering the very best amenities for sport lovers, with more than 25 activities available as well as a cutting-edge, modern clubhouse. The official winter training base for England Golf’s elite squads, Quinta do Lago is perfect for a relaxing family holiday in exquisite surroundings and offers the very best in award-winning sports and leisure facilities. The resort’s three championship courses are matched by outstanding practice facilities, with a state-of-the-art TaylorMade Performance Centre – the only such facility in southern Europe – and new short game area available in addition to the resort’s Paul McGinley Golf Academy. Set among 2,000 acres of the picturesque Ria Formosa Natural Park, there’s plenty to keep guests occupied away from the fairways, with events, tennis, cycling and watersports just some of the extensive leisure activities available.